It is important that before recharging the vehicles air conditioning system that it is evacuated to remove moisture and to check for any leaks. Once the system has been placed into a vacuum for 45 minutes it needs to hold that vacuum for five minutes. 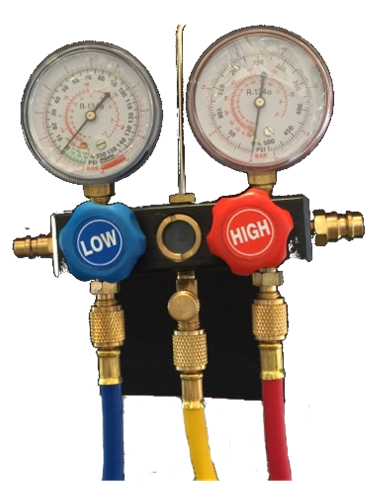 Once everything has been completed, then it can be recharged with refrigerant per manufacturer’s specifications. ​​1. Locate the low and high side charging ports inside the engine bay. Unscrew the caps and keep them safe and free from contamination (replace once the job is complete). The caps keep dirt and contamination from entering the system. ​​2. Once the cap is unscrewed, make sure there is no dirt etc where the connection will be made. 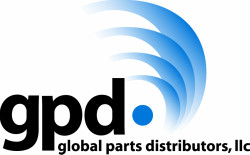 If the cap is broken or un-repairable, gpd has a cap and valve set available that is specific to your vehicle. ​​3. Connect the lines, blue to low side, red to high side, and yellow to the center connection. The yellow will be used to vacuum and recharge the system. Make sure the knobs to the low and high ports are closed. Set your gauge where it can be easily read and the lines will not become tangled. Most technicians prefer to hook the gauge set into the hood latch, where it is easy to access. 4. Connect the low and high side connectors. The blue line will go to the low side and the red to the high side. Due to the design of the connectors, you cannot place the wrong line on the wrong connection. Screw down the connectors to make a tight fit, free from leaks. ​5. 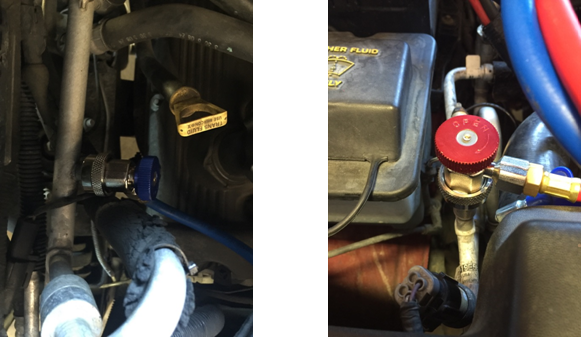 Connect the yellow hose to the vacuum pump and recovery line to a recovery tank. Turn the vacuum pump on. ​​6. On the gauge set, turn the low side knob. The gauge will start to move towards zero. Once the system is in a vacuum and the needle on the gauge is stable, start the count for 45 minutes with the vacuum pump running. After 45 minutes, if the gauge needle hasn’t moved, close the low side knob off and watch the gauge for another 5 minutes. If there is no change, then disconnect the yellow line from the vacuum pump. 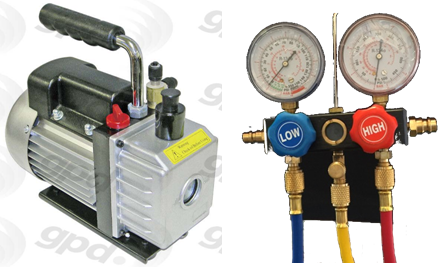 Connect the refrigerant and charge to the manufacturers specifications.